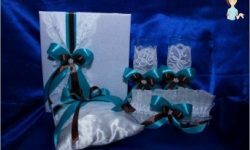 Home / Needlework / Daisies from plastic bottles - unfading beauty with your own hands! Daisies of plastic bottles - unfading beauty with his own hands! 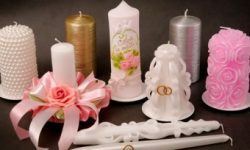 Every year more and more people are fond of hand maid - learn to make from improvised materials various interesting things, thus giving "Rubbish"A second life. What people do not do with their own hands: organizers from cans, furniture from wooden pallets, bags of old trousers and much more. 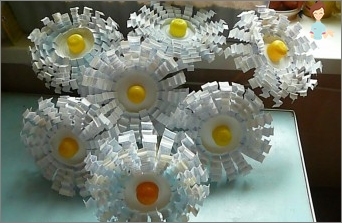 But today I want to talk about how to make daisies from plastic bottles. Why do they, you ask? Yes, everything is simple, with such artificial bouquets it is quite possible to decorate a household plot or revive a boring room in your own apartment. 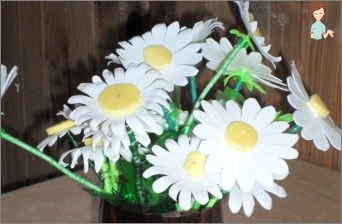 Perhaps, this kind of creativity, like the creation of chamomiles, you will like it so that soon you will complete your plastic bouquet and other flowers. Flowers from plastic containers can be an excellent decoration of the country site, and such products are harmoniously supplemented as already available living bed, and will replace it. 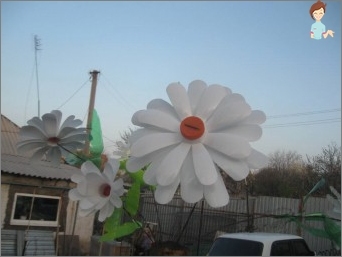 Making flowers is recommended large and bulky,So they will look more spectacular and attract the views of neighbors. 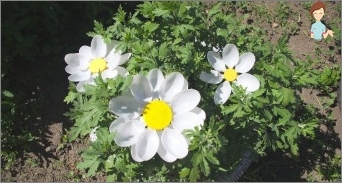 If you want to make a full-length chamomile, then they will have to do a lot, so that they occupy the whole flower bed. Single copies will look unattractive. For the middle of the flower, find some old yellow lid, you can use the case from "Kinder-surprise". If you find all the necessary materials, then you can start creativity. The resulting flower is fixed on some "Stalk", For example, take an iron rod. And to make it look like a stalk, you will need a plastic container of green color, cut out a spiral from it and wind it on the rod. To keep the plastic well, submerge it a little on the fire. By the principle described above, you can make any amount of chamomile and decorate your garden with them. Such crafts are fearless weather, so they will please the eye year-round. If you wish, you can make flowers from tareDifferent shades, so that a real riot of colors is obtained. True, it is important not to overdo it, otherwise instead of beauty will turn out a motley mess. In all need a measure! You can do big chamomiles now, but theySuitable only for the street. Of course, according to the above instructions, you can try to make small flowers, but it is better to use another scheme for creating a bouquet. 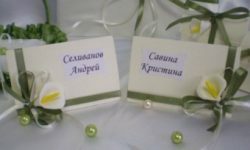 For creating "Home"The bouquet needs to be stocked with a landscape sheet, pencil, white, orange and green containers, scissors, a candle, an awl and a piece of wire in a green winding. Cut out the improvised green leaflets and connect the flower with a wire. Then fix everything on the wire, the bouquet is ready. As you can see, creating beautiful bouquets with bottles is not difficult. The only thing you will need is a little patience. Good luck and new creative success!